A delicate tending astringent cup with the distinctive ‘Muscatel’ character. Hints of currant create an almost wine-like taste. During the 1930’s the garden was owned by Mr. Bagdon who lived in London but visited the tea garden regularly. He had two daughters. The younger daughter named Margaret; who when she saw the tea garden fell in love with it, hoped one day she would have an opportunity to return. Sadly she fell ill on board ship during the return trip to England and died soon after. In her memory, her father changed the garden’s name to Margaret’s Hope. It is believed that she visits the estate bungalow from the western side, coming through the main guestroom and leaving from the study through the verandah to the tennis courts. The bushes at Margaret’s Hope are almost entirely the Chinese Jat (genus) accounting for the green leafed tippy appearance of the manufactured leaf and the superb fragrance. Because the tea is grown at such high altitudes and in relatively cool weather the bushes do not grow quickly, and as such the production is limited. The best time of the year for quality is during ‘secondflush (end May – end June). 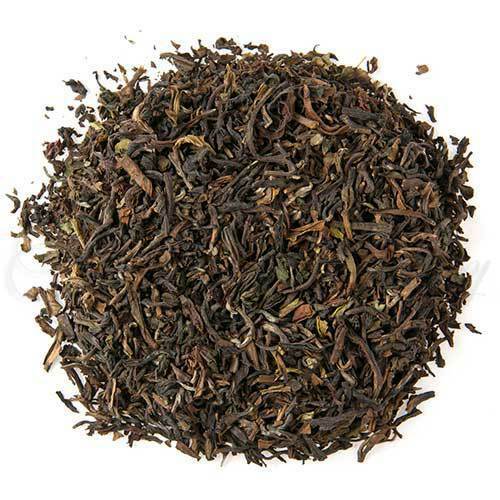 During this time Darjeelings are incomparable to any other tea in the world. The fragrance and taste is a complex bouquet that reaches right out of the cup. Some would describe the taste as nutty; others find it reminds them of black currants, but most often it is described as similar to the taste and fragrance of muscat grapes. Autumnal – Not always available depending upon the weather, they are typified by a round taste and coppery liquor. Excellent as a breakfast tea. Hot tea: Put 1 slightly heaping tsp. of loose tea for each 7-9 oz/200-260 ml of water in the teapot. Pour freshly boiled water over tea. Steep 3-7 min. Add milk & sugar to taste.